Pest Bird Spike Systems are predominantly used against pigeons and gulls, to prevent them from defacing your property and causing a nuisance. 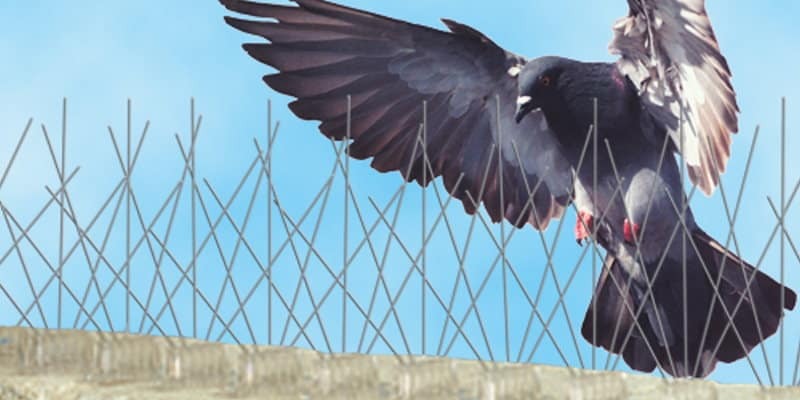 Normally suitable for up to medium bird pressure, although heavy-duty spikes can be used in heavy pressure Pigeon infestations provided other management controls are also implemented. As many property owners will know, birds don’t need to nest within your building to cause some serious problems. Whether they are on the lookout for food down below or just need a place to rest, birds- especially gulls and pigeons- tend to gather on any ledge they can find. Naturally, this can be more than a little frustrating for those who own the ledge in question, as the birds will foul all over it and end up causing a major health and safety issue. What’s more, the noise from these birds can be extremely annoying to those inside, especially in buildings like hospitals or hotels where residents cannot get away from the sound of squawking pests. Rather than allowing this problem to continue, it’s time to do something about it- and pest bird spike systems could be just the solution you are looking for. Pest bird spike systems are made up of a series of wires which jut out from the surface they are placed on and block off access to these areas by birds. Despite the connotations that the word “spike” brings, these systems are actually fully humane and cause no harm to pest birds. Rather, they merely act as a physical barrier, so that there’s nowhere for the birds to perch on ledges. Since they are so effective, this type of system is ideal for protecting buildings or structures in a wide range of situations, from daytime perching to night roosting sites. Pest Bird Spike Systems are relatively discreet, as when properly installed they can be difficult to spot even from a few meters away. However, they prove to be incredibly effective in stopping birds from fouling your building and causing a nuisance. When they find that their path to the ledge is obstructed by spikes, gulls and pigeons will simply fly off somewhere else, leaving your ledges clean and pest-free. As well as being discreet, bird spike systems are also a highly versatile pest control solution. They can be used to protect ledges, parapets, signs, beams, pipes, gutters, chimneys, roof ridges, and more- virtually any surface where pigeons, gulls, and other pest birds might gather. Pest Solutions carry out all aspects of pest bird control throughout all areas the UK. As well as pest bird spike systems, we also offer a wide range of additional pest bird deterrent systems. Contact us today, and we will be happy to arrange a completely free pest bird control survey. This will enable our technicians to come up with the most effective tailored solution to ensure that your building remains bird-free in the long term. Our expert team of Pest Bird Control Specialists are highly trained and carry IPAF and PASMA certification to ensure that all work carried out at heights is done in a professional and safe manner. You can be certain that our technicians are fully equipped to deal with your pest bird problems, and they can also offer useful advice on other steps you can take to keep your property free from other pests, too. Our mission is to provide the most effective pest control service possible, so if you are also having problems with additional pest species, we will be more than happy to help with these as well. In addition, we have a number of other pest bird control methods at our disposal, so you can be sure we will come up with a solution that delivers real results. Extensive UK coverage from our many local regional branches gives Pest Solutions the capability to react speedily to any pest problems you might be facing. We can install pest bird spike systems remarkably quickly, to keep any damage that gulls and pigeons might be doing to an absolute minimum. We know you won’t want to wait around if pest birds are defacing your property, so we always respond as fast as possible to all enquiries. Call today and let the expert pest technicians here at Pest Solutions get the issue under control right away. To have a member of our Pest Control service team carry out a FREE survey or a service visit today, just phone 0800 027 2555. Alternatively, click here to find the details of your local Pest Solutions branch.